Mouse monoclonal Nup153 antibody [QE5]. Validated in WB, IHC, Flow Cyt, ICC/IF and tested in Mouse, Human. Cited in 34 publication(s). Independently reviewed in 4 review(s). ab24700 recognises NUP153 as well as two related nuclear pore complex proteins: NUP214 and p62. In Immunocytochemistry, this antibody gave a positive signal in HepG2 cells. Our Abpromise guarantee covers the use of ab24700 in the following tested applications. WB 1/1000. Detects a band of approximately 154 kDa (predicted molecular weight: 154 kDa). Immunocytochemistry/ Immunofluorescence - Anti-Nup153 antibody [QE5] (ab24700)This image is courtesy of an anonymous Abreview. 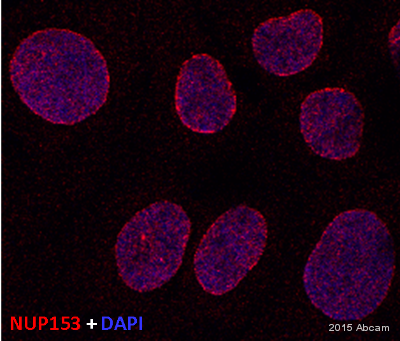 Immunocytochemical analysis of U2OS cells, labeling Nup153 with ab24700. Cells were formaldehyde fixed, permeabilized with NP40, and blocked with 3% BSA for 1 hour at 21°C. Immunostaining with ab24700 diluted 1/100 for 12 hours at 4°C. Human and mouse cells treated with different concentrations of ab24700. The cells were fixed in 4% formaldehyde and permeabilized in 0.2% Triton x100 for 10 minutes at room temperature, then washed 3 times in PBS. The fixation and permeabilization was carried out in a single step. The image shows clear staining of the nuclear envalope (green). The DNA is stained with DAPI (blue). Overlay histogram showing HeLa cells stained with ab24700 (red line). The cells were fixed with 80% methanol (5 min) and then permeabilized with 0.1% PBS-Tween for 20 min. The cells were then incubated in 1x PBS / 10% normal goat serum / 0.3M glycine to block non-specific protein-protein interactions followed by the antibody (ab24700, 2µg/1x106 cells) for 30 min at 22ºC. The secondary antibody used was DyLight® 488 goat anti-mouse IgG (H+L) (ab96879) at 1/500 dilution for 30 min at 22ºC. Isotype control antibody (black line) was mouse IgG1 [ICIGG1] (ab91353, 2µg/1x106 cells) used under the same conditions. Acquisition of >5,000 events was performed. ICC/IF image of ab24700 stained HepG2 cells. The cells were 4% PFA fixed (10 min) and then incubated in 1%BSA / 10% normal goat serum / 0.3M glycine in 0.1% PBS-Tween for 1h to permeabilise the cells and block non-specific protein-protein interactions. The cells were then incubated with the antibody (ab24700, 1µg/ml) overnight at +4°C. The secondary antibody (green) was Alexa Fluor® 488 goat anti-mouse IgG (H+L) used at a 1/1000 dilution for 1h. Alexa Fluor® 594 WGA was used to label plasma membranes (red) at a 1/200 dilution for 1h. DAPI was used to stain the cell nuclei (blue) at a concentration of 1.43µM. Methanol fixed HeLa stained with ab24700. This antibody brilliantly highlights the nuclear membrane (green). The golgi is stained with Giantin (yellow). Human and mouse cells treated with different concentrations of ab24700. The cells were fixed in 100% methanol for 20 minutes at -20°C, then washed once in PBS. The image shows clear staining of the nuclear envalope (green). The DNA is stained with DAPI (blue). Publishing research using ab24700? Please let us know so that we can cite the reference in this datasheet. For your QE5 Nup153 antibody, what is the exact epitope the ab has been raised against (N, Zn finger, or C term)? Thank you for your enquiry. The antibody was raised against rat liver nuclear envelope proteins extracted in TX buffer (50 mM triethanolamine [TEA], pH 7.4, 500 mM NaCI, 0.5 % Triton X-100, 1 mM DTT, 1 mM PMSF and 1:1,000 CLAP [10 mg/ml each of chymostatin, leupeptin, antipain, and pepstatin in DMSO]). The exact epitope has been mapped to a region lying between residues 1,301 and 1,319. I enclude below the original paper that designed this clone and identified that epitope. http://www.jcb.org/cgi/reprint/126/3/603 Pante N et al. Interactions and three-dimensional localization of a group of nuclear pore complex proteins. J Cell Biol 126:603-17 (1994). PubMed: 8045926 I hope this information helps. Please do not hesitate to contact us if you need any more advice or information. Thank you for your enquiry. I have been in touch with the source of this antibody and unfortunately I do not have a western image available at this time. I do however have soem images used to QC ths image by immunofluorescence. 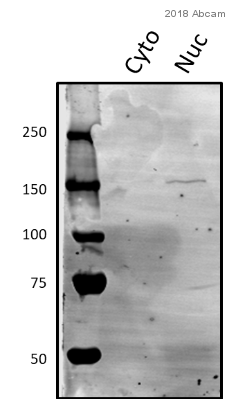 I have sent a follow up email with an image of the staining using this antibody. There is clear labeling of the nuclear lamina. A secondary alone control is used as a negative control. I hope this information helps, please do not hesitate to contact us if you need any more advice or information.